Yet the rising junior is now considered one of the state's best. 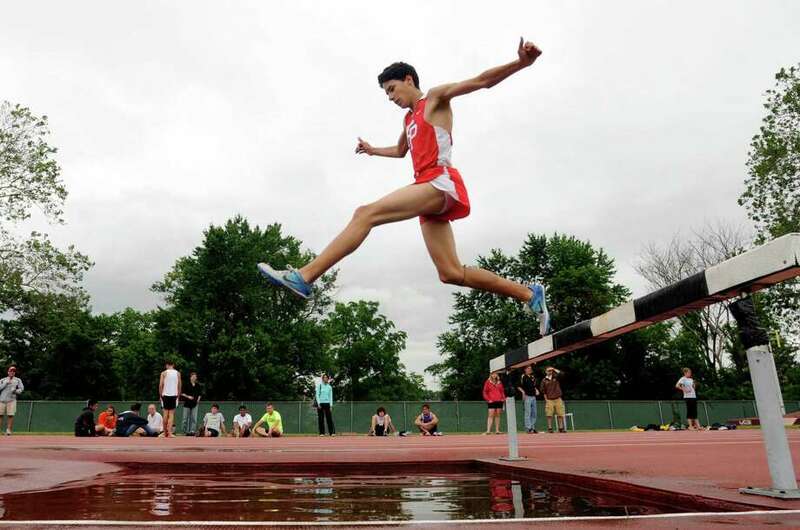 Alvarado closed his sophomore season with a win in the 3,000-meter Steeplechase at the State Open on June 13 in New Britain. "It was different," Alvarado said. " The steeplechase win capped Alvarado's breakout sophomore season, where he emerged as Prep's No. 2 cross country runner and second-best distance runner in track for Prep, behind University of Virginia-bound Connor Rog. "He had a great sophomore season," Prep coach Bob Ford Jr. said of Alvarado. "We knew he was really talented, but it turns out he's real competitive." Rog was Prep's runner in the 3,200-meter race, resigning Alvarado to the 1,600-meter. But the sophomore still had standout performances, placing third in SCC's, fifth at Class LLs and sixth at the State Open. Alvarado also qualified as a 1,600 runner for the New England Interscholastic Outdoor Track & Field race on June 9 in Saco, Maine, placing 10th. Rog, along with Air Force-bound teammate Patrick Corona, Alvarado and Adam Vare, made up the Jesuits' 4x800-relay team that finished first at SCCs, then second the rest of the outdoor year-- including the school-record 7:50.55 at Class LLs and finishing as the top-Connecticut team at New Englands. "We had never run together before until SCCs," Alvarado said. "And then at states we set a school record." Rog had a big influence on Alvarado's progression, especially in his training. Alvarado struggled to stay focused his freshman year. "Connor pushed me through workouts," Alvarado said. "I was more interested in meets and not practice and I did dumb things during races. My freshman year was a learning experience." Ford admitted that expecting a freshman to follow a strict regimen would be an unreasonable expectation. "For a freshman to come right in and focus would be highly unusual," Ford said. "They're going to high school for the first time and he was a kid who decided a week before the cross country season he'd run." Alvarado admitted this was the case, as he'd chosen running over soccer-- a sport he'd quit in sixth grade -- just days prior to the 2010 fall season. "Cross country was the easier sport," he said. "You can't jump back into soccer after three years off." But Ford pointed to Rog, Corona, and the rest of Prep's talented cross country team that fostered a team-oriented environment that grabbed Alvarado. "Corona has the most positive attitude, and we've held him out to help (Alvarado)," Ford said. Alvarado shared that sentiment, but also that the troika have credibility. "They know what it takes to win the Opens," he said. Ford's father and Prep assistant, Bob Sr., has also developed a special relationship as Alvarado's coach. Ford Sr. even helped Alvarado train for the steeplechase, taking him to Sacred Heart University for a practice day. Ford Jr. recognizes how valuable Senior has been to Alvarado's progression. "Dad is a very consistent factor for Christian," Ford Jr. said. "They live about a mile apart and if dad needs help planting bushes, he'll call Christian." As Rog and Corona depart for college running, Alvarado has prepared himself to take on a leadership role. "It'll be a big transition, going from the guy who looks up to all the senior to the leader," Alvarado said. "But it is something I look forward to." Leadership is also Ford expects, especially at cross country. "You can't have your top-runner not be a leader," Ford said. As Alvarado prepares for his junior campaign -- a year he hopes will lead to enhanced Division I running opportunities -- he has high expectations as well. "I want to be top-three in the state in cross country," he said. Ford Jr. believes these are realistic opportunities, but as long as he keeps working. "I want him to think big, that's where his goals ought to be," he said. "But if I get a sense that he'll screw around, I'll remind him that there are others around the state working that hard. And he knows it."